Some of my friends and I attended camp in 1968 and 1969. It was a great experience and much like the people who write and add comments it always triggers great memories. I attended Gettysburg College and my last contact was with the younger of the Picketts as he was slightly older and went there too. I recently found the web site and thought you might be interested that Hyde Bay will be represented at the London Olympics in 2012. 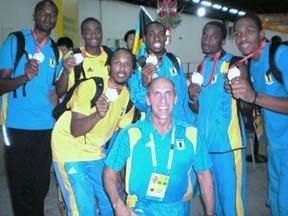 I am the Team Doctor and Coach for the Country of The Bahamas and have been doing this for the past five years. I also have done the same for the Chicago Cubs, White Sox, Minnesota Twins, and other teams in the past. Pierre is on the site and he did have a great influence on me back in the days of playing baseball which was my major sport. From hearing the "Strawberry Shortcake" cheer as we would go out the door, I went on to play ball in high school, college, and beyond. I remember the "short porch" in right field at Chenango up to the road. I pitched those games and we beat them most of the time. Pierre actually taught me my first true wind up mechanics. I remember him more for giving head butts to other counselors and going to Glimerglass pizza to bring us back some late at night. In my time I have trained 16 Hall of Fame baseball players and have gotten back to Cooperstown a few times to see them inducted but never had the time to find the camp road. I could go on for a lot more but even though I went to other camps after that, there was nothing like Hyde Bay. So thanks for all the memories that you all provided and it was certainly a place that played a significant part in what was to happen in later life. My best to you all and perhaps people like Marty Sutton, Jamie Spragins, the Hughes brothers, Pierre Black, etc. will always look back fondly on those days.